The California Department of Motor Vehicles (DMV) is responsible for collecting approximately $4.1 billion annually in vehicle registration fees. Centralized computer systems in Sacramento communicate with local systems across 167 field offices throughout the state to handle the complex task of calculating registration fees for the nation�s largest population of new and used autos, trucks, motorcycles, vessels and other vehicle types. The DMV Automated fee system (DMVA) is deployed on servers at each of the DMV�s 167 field offices and its headquarters. It processes customer initiated vehicle registration transactions in real time in IBM�s proprietary Event Driven Language (EDL). 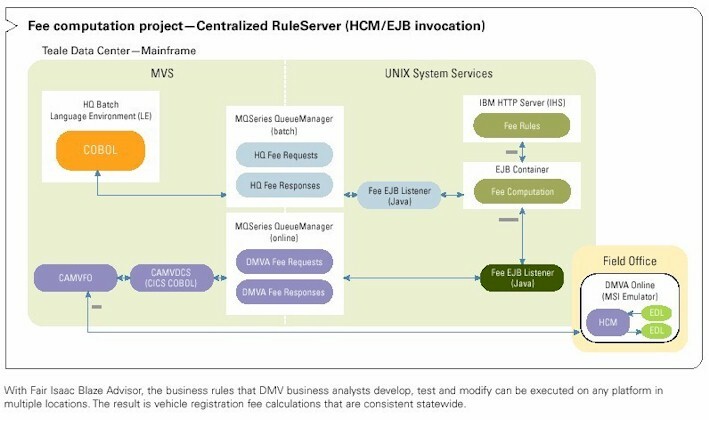 The DMV Batch fee (DMVB) systems are deployed on mainframe computers at the Teale Data Center, where the renewal notices are generated and the Remittance Processing system handles most of the �DMV by mail� processing in Common Business Oriented Language (COBOL). Because of the two different computing platforms, changes and updates required two separate development efforts, two different analyst teams, and two different databases. This made it difficult to coordinate changes and ensure consistency between the two systems. Due to the complexity of the programs and duplication of effort required to make changes to two separate systems, the DMV was challenged to meet legislatively mandated deadlines for fee changes. Even minor changes required extensive analysis and programming efforts by the legacy system�s development staff. There also was a real and practical need to update the systems as they had met their physical limitation; the DMV reached a point where they couldn�t add more statements to the system. After discovering all of the places where Vehicle Fee calculation rules had been programmed, the VR Fee Comp team�s analysis uncovered that instead of simply recoding the existing systems, they needed to look at newer technologies and methodologies for managing their business processes. The team recognized that Business Rules Management Software (BRMS) would enable the separation of business logic, policies and processes from the actual application programming. The ability to give the power of business policies and business changes to analysts instead of programmers was a monumental change to the current application development process for the DMV, as often a limited amount of programming resources resulted in latency to system updates. In addition to faster system changes, a business rules system could enforce the greatest levels of compliance with the legislative mandates. With a keen sense for developing a solution that would easily integrate with future technology and assure the solution�s life-cycle longevity, the VR Fee Comp team was at the forefront of evaluating newer technologies, such as Java, and Java applications servers that would allow for an open and internet-ready system to facilitate future goals of web enabling components of the vehicle registration process. The DMV blazed new trails by seeking innovative technology to create a new solution. Upon delving into the project, however, the DMV realized the necessity existed to also conduct a best practice review of their business policies and practice methodologies. The resulting clearer understanding of their decision infrastructure proved to be an invaluable process. They examined a business rules methodology, created a blueprint of their business processes, and looked at normalizing and understanding the terms and policies that were already in place. It was necessary to look at the existing business policies, the legislation that affects them, and how a consolidation of look-ups and interrelations could be architected to simplify future updates. The DMV�s Vehicle Registration team reengineered a vehicle registration fee system that could work in conjunction with both systems in a manner that would be transparent to the end user. 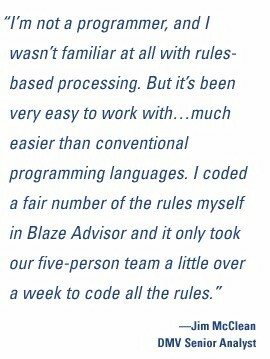 The revised solution resulted in a Fair Isaac Blaze Advisor business rules engine, IBM WebSphere application server, and a Java 2 Enterprise Edition (J2EE) solution operating on a mainframe computer. The development team, however, faced the challenge of having little or no experience in Java software development. Most of the team was experienced with COBOL and Assembler programming. Fair Isaac Professional Services offered Java software training and on-site assistance during the pre-project implementation phase. The DMV was able to move smoothly from design and structure of conceptual rules to development and execution without fear of overlooking or misinterpreting key decision factors. Leveraging the power of a centralized rules server built with Blaze Advisor and its rule maintenance applications, the DMV successfully gives the non-technical analysts who are responsible for overseeing legislative compliance the ability to ensure proper implementation of the policy rules across the DMV vehicle registration fee systems without having to become programmers. They also defined �templates� for certain types of rules that business analysts should be able to create on their own. These maintenance facilities are available through automatically generated web pages that eliminate formal rule syntax and custom editing environments. The DMV has successfully developed a revolutionary solution that boasts a Fair Isaac Blaze Advisor business rules system as the cornerstone of its vehicle registration fee systems. The first phase of the project implemented the new technical environment and fee business rules for vessels (i.e. boats and other watercraft). Vessels were selected for the first implementation because it represented a lower volume transaction count and therefore a lower impact to DMV field office operations. This phase was completed and successfully released to production in March 2003. The second phase of the project implemented the new fee business rules supporting expedited legislation for the Vehicle Registration Penalty (Reg penalty) fees which could not be implemented in the legacy fee system due to its limitations. This phase went live across the DMVA in April 2003. The Reg penalty fees system processes 60,000 to 75,000 business transactions per day. The third phase of the VR Fee Comp project went into production in February 2005. Phase three implemented the rules and fees for autos, commercial vehicles, trailers, motorcycles and off-highway vehicles. It required over 2,000 rules and numerous rule-sets, rule flows, and tables and processes for several hundred thousand business transactions per day. While many projects boast tens of thousands of rules, the DMV team�s thorough methodology resulted in an effective rule-set of 2,100. With an efficient use of intermediate rules, the DMV proudly reduced the overall rule-set that results in less coding. It also provides better visibility into the rules that are in effect, an understanding of the levels of business change and how changes to the rules will interact and affect subsequent business processes. The DMV�s new system leverages business rules to support mandated and changing legislative laws. Thus far the fee comp team has focused on updating the DMVA aspect of the project. With the deployment of the fourth phase of the project to production the team moved towards the consolidation of DMVA and DMVB. The DMV�s new system leverages business rules to support the mandated and changing legislative laws. Coupled with IBM�s WebSphere Applications Server, Blaze Advisor positions the DMV to make future system enhancements more easily and to add centralized and consistent rules to delivery channels such as self-service websites and telephone response systems. �The implementation of the VR Fee Calculator on the Internet further supports our strategic business and IT goals by improving the integrity and quality of its products and services to customers,� added Seitz. �The new rules powered system and resulting business practices should continue to lower our operating costs by decreasing the number of telephone calls and transactions in the CA DMV Field Offices and Telephone Service Centers.� The system went live on June 30, 2005 as the main feature on their webpage and is a huge success. Now citizens can go see how much it would cost to register a vehicle or boat in California before purchasing it and will be able to see how much their registration fees will be in future years. To see the application run live, visit https://mv.dmv.ca.gov/FeeCalculatorWeb/index.jsp. Agility: Moving to meet legislatively mandated deadlines for fee changes for the state can be made rapidly. Adding to the overall flexibility to the system, local taxes and ordinances that increase vehicle registrations can be easily made. For example, the DMV has made changes to add an additional �air-quality improvement tax� to citizens who reside in a specific county of California. Even more specific than the county, the tax is only applied to certain zip-codes within the county. With added agility and flexibility, these types of changes are now all possible. 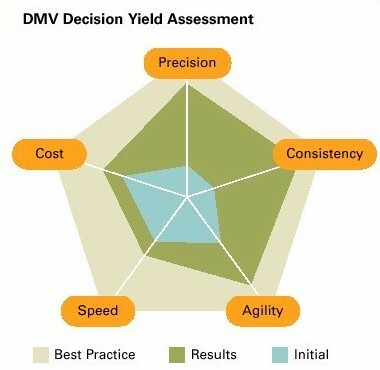 Precision: When a new policy or legislation is implemented, the DMV is sure that the system will precisely calculate the fees correctly as the business analysts make the changes. In addition, the new system has the business logic separated so that the DMV is easily able to look at how changes to the system will affect the calculations. This is particularly important when demonstrating that the registration fees are calculated in a routine and consistent manner. Speed: Routine changes to the systems as well as major updates to registration criteria and fee structures can be made much faster. Cost: Updates to the systems today are much more cost effective. Moreover, migrating to a California citizens �self-service� architecture for new delivery channels, such as self-service web sites and telephone response systems, will be more cost effective in the future. Fair Isaac (NYSE:FIC) "makes decisions smarter". The company's solutions and technologies for Enterprise Decision Management give businesses the power to automate more processes, and apply more intelligence to every customer interaction. Through increasing the precision, consistency and agility of their decisions, Fair Isaac clients worldwide increase sales, build customer value, cut fraud losses, manage credit risk, reduce operational costs, meet changing compliance demands and enter new markets more profitably. Founded in 1956, Fair Isaac powers hundreds of billions of decisions per year in financial services, insurance, telecommunications, retail, consumer branded goods, healthcare and the public sector. Fair Isaac also helps millions of individuals manage their credit health through the www.myfico.com website. Headquartered in Minneapolis, Minnesota, Fair Isaac reported revenues of U.S. $706.2 million for fiscal 2004. The company currently employs over 3,000 people in 10 countries. Originally an operations research consulting firm, Fair Isaac pioneered the use of credit scoring for risk management. Credit scoring is an application of predictive modeling, the study of historical data to make forecasts about future performance. Initially, credit scoring was used to help lenders make better decisions about which credit applicants to accept. Using computers and proprietary algorithms to analyze thousands or millions of pieces of information on past customers� behavior, Fair Isaac could develop a �scorecard� that would identify the credit risk of any new applicant based on a few key pieces of data. For commentary related to Enterprise Decision Management check the edmblog at www.edmblog.com. What is the purpose of the California DMV system? Is the enterprise decision management software part of a data-driven Decision Support System? Why or why not? What is a "legacy" system? What is the major benefit of using Blaze Advisor? Why? Should other states create this type of decision support capability? Why or why not? What problems or difficulties do you anticipate with the use of this type of decision management solution? Fair Isaac Staff, "Business rules drive modernization of legacy transaction systems at the California Department of Motor Vehicles", September 8, 2006, at URL DSSResources.COM. Scott Olsen, Fair Isaac, provided permission to publish this case study at DSSResources.COM on July 17, 2006. Olsen's email address is ScottOlsen@fairisaac.com. Prepared in 2005 by Fair Isaac Corporation. This case study was posted at DSSResources.COM on Friday, September 8, 2006.